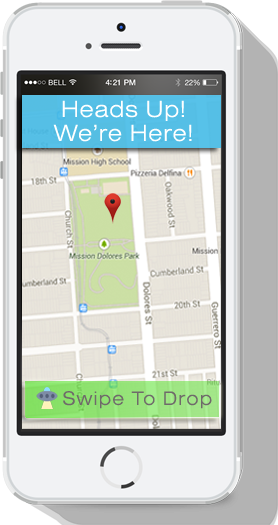 The new QuiQui (pronounced "quickie") delivery service and associated app will provide fast (FAST) delivery service of pharmacy items in San Francisco's Mission District starting this summer. Why so fast? QuiQui uses a fleet of autonomous drones to deliver the goods. According to the QuiQui website, most orders can be dropped off within fifteen minutes. Beat that, Amazon! Or even Sina Weibo plus Taobao! It most certainly is. Recently the FAA lost a lawsuit allowing it to ban commercial drones. Additionally, full size aircraft must maintain 500 feet from populated places and landmarks. Our drones fly below 500 feet AGL, and nowhere near airports. Why only drug store items? Unfortunately, it's not commercially viable for drones to transport larger things yet. We chose pharmacy items because they're typically very small and easy to transport. Our drones have patent pending software to mitigate their damage in the event of catastrophic failure. If you accidentally drop your order in a tree, we can help you with that too. Have any of the drones started looking for Jon Connor? No. Our drones are aware of many things, but "self awareness" is not on our feature list. Glad to see that QuiQui has a sense of humor.